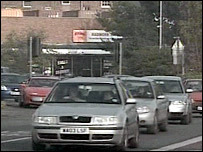 Congestion charges could be introduced in Exeter to tackle traffic problems. Devon County Council is considering introducing charges for people who drive into the city centre and charges for people who park at work. The council says it will spend income from the charge on introducing a new bus system which has priority at traffic signals. The plans are in the county council's unsuccessful bid for £1.2m funding from the Department for Transport. Councillor Margaret Rogers said: "Congestion charging is only one option to see whether it is desirable and whether it will work." But Ruth Bridger of the AA Motoring Trust urged the county council to consider the costs against the returns of the scheme. She said: "These schemes do not make much money in themselves, their main revenue is from penalties. That could be less than predicted and suddenly the money is not there to fund bus services. "It is also a real hassle for car drivers and no-one gets any compensation for the inconvenience." She said that park and ride schemes ignored the needs of those who worked unsociable hours, such as office cleaners. She said: "People also like to have their cars at work, especially if they are carers and there is an emergency at home."